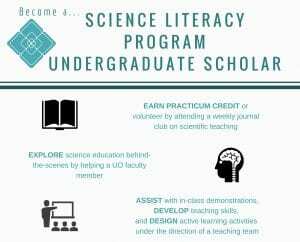 Undergraduates looking to expand their interest in science teaching and communication are invited to apply to become an SLP Undergraduate Scholar. For one term, scholars work with a faculty mentor in a class that fits their scientific interests. Scholars get hands-on experience designing and leading class activities, mentoring fellow undergraduate students, and building teaching skills by collaborating with faculty and graduate students. This program is a great resume booster, allowing students to build leadership, teaching, and communication skills around science teaching and communication. Apply to be an SLP Scholar for Spring 2019. In this practicum, undergraduate science students will explore the concepts and theories behind Scientific Teaching. Students will develop inclusive classroom activities and assessments to support student learning in a science course. Upon completion of this practicum, students may have the opportunity to co-teach a Science Literacy Program course under the direct supervision of a faculty mentor to continue developing and applying teaching skills. Have the opportunity to explore science courses behind-the-scenes as a teacher. Receive mentored teaching support from a faculty co-instructor. Learn about scientific teaching and active learning and how to apply it to science courses. Explain the theory and evidence behind scientific teaching and active learning as techniques that support student learning. Design assessments and activities to implement active learning techniques in a SLP affiliated science course in partnership with a teaching team. Read and practice applying pedagogical theory from current science education literature to classroom experiences. Coordinate classroom support activities with faculty mentor and teaching team. Write and discuss reflections of the experience.